The intense hot summer kept me away from writing for the last few days. While, I am looking for an opportunity to cool down under a gurgling waterfall, I took a journey through memory lane in search of elusive waterfalls. Last winter, I trekked on the Chadar (Frozen Zanskar River) in Ladakh in search of THAT which is can be only experienced. As we walked on snow on the frozen Zanskar between the high cliffs of Western Himalayas, numerous waterfalls of different sizes were frozen along the mountain side. We often stopped, to take pictures of these doe eyed beauties and as is my wont, I imagined them in high summer gurgling down with beguiling charm. If you thought that only Niagra froze in winter to present a memorable sight, think again !! Here is a photo story of the Waterfalls on Chadar Trek. A little after Shingra Koma, we stopped in front of this beautiful falls (Tsumo Bhao) which were partly frozen. The locals bent in reverence while our guide narrated the story of the falls which appeared to come out through two nostril like gaps in the mountains. Many years ago, this area was supposedly dry and people were living in abject misery for want of water.A Buddhist Monk went all the way to Kailash to pray for water and he was gifted with a box that was to be opened only when he reached his destination. He was carrying it back with utmost care but it was getting heavier and heavier until he could not hold it any longer and water gushed out filling the entire area. A day later, faced with inclement weather we halted in Tibb and then took a detour climbing across waterfalls and through narrow icy caves treading carefully on the slippery surface. An hour later we stood in front of one of the best creations of nature that I have seen so up close and personal. I ran my fingers on the frozen droplets, the tough hardened transparent exterior giving us a peek inside which was waiting for summer to arrive. I looked through my camera lens and then through my eyes reminding me of the emotions that we often hold inside, hardened and hurting which when released would transform us into a different self. A narrow stream of light on the waterfall was simply ethereal and we moved on. The queen of waterfalls is near Nerak, the last stop in the Chadar Trek. 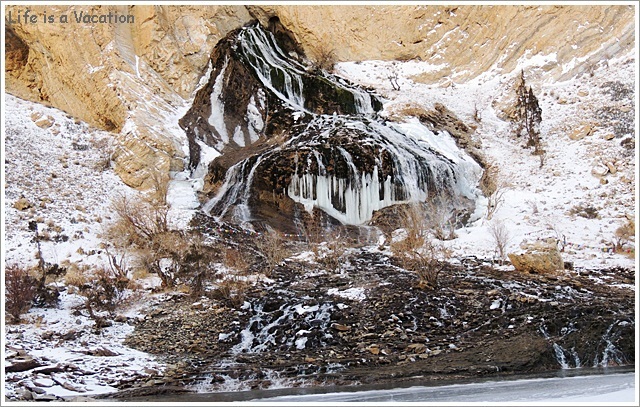 The huge cascading waterfall is frozen in winter but its imposing disposition attracts trekkers from all over the world. As the frozen mass cascades down several metres with the backdrop of a lone Juniper tree which seemingly protects and overlooks, you cannot help but wonder about the guiding hand of the divine during the toughest moments of life. Nature is the biggest master and as I spend more time in its arms, embracing every sight that I am blessed with, I experience the divine in many forms. Chadar Trek is one of the glorious winter treks in India held between Jan 15th and Feb 15th. This is mesmerising. ..the pix, the tale and the journey! Thank You. Where is your next travel planned? Nothing specific but Himalaya it has to be.